375-017C Privacy, Property or Permission? Need our Models for Regulating Personal Genetic Material be Mutually Exclusive? 375-823 Should Advances in Internet Filtering Technology Affect Regulatory Choices? 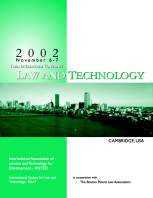 This publication covers the following topics: Privacy, Property, and Personality; Privacy Law and Regulation; Intellectual Property; Technology; Software Products and Law; Digital Rights and Legislation; Internet Law; and Electronic Commerce.